Founded in 2003, BlueHost has gradually transformed into a mammoth web hosting provider. BlueHost’s growth really exploded within the past few years when they decided to focus on delivering exceptional reliability and lightning fast speeds with their dual quad processor performance servers. Rather than outsource and use third party servers, BlueHost engineers’ custom build each server in-house. Due to this shift in focus, BlueHost saw a drastic increase in the number of webmasters with high volume traffic sites. BlueHost further capitalized on this by custom tailoring their plans and providing scalability, making the upgrade procedure to a dedicated or VPS account an inexpensive and one click process. As growth continued, BlueHost saw a trickledown effect whereby individual webmasters slowly joined in on this top performance web hosting service. Now, BlueHost employs over 700 workers who help maintain their ‘A+’ standard in the web hosting industry. BlueHost also provides their customers with many features offered by web hosting leader iPage such as multiple e-commerce features, various free website scripts and a variety of multimedia features. Mutiple databases are supported such as PHP 5, Perl 5 and Ruby on Rails along with many others. 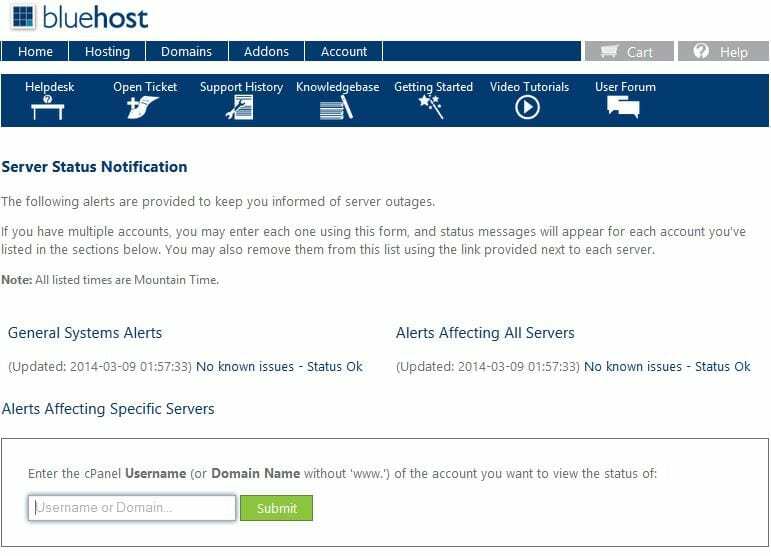 Additionally, BlueHost’s security measures live up to their expectations as their systems are monitored 24/7 and are backed up by UPS Power Backup and diesel generator power backups. We would like to note that since BlueHost largely caters to businesses who generally upgrade to dedicated or VPS accounts, their shared hosting plans experience a slight amount of CPU throttling. This may slow down your site but on a whole, this rarely happens and when it does, it tends to occur during the wee hours of night and only for a matter of minutes. There are many aspects when it comes to customer support and while response times are important, they are not the end all be all of customer service. BlueHost clearly understood this from the beginning. Not only are they extremely efficient with their response times, but their service representatives understand all potential hosting issues – both simple and complicated. Further, their reps are based in the US which we must admit is a nice change over countless companies who outsource overseas to reduce costs. From our experience, outsourcing (specifically overseas) largely ends up frustrating customers. If it’s not a language barrier, it’s a lack of knowledge issue. Needless to say, we were extremely pleased to see that BlueHost did not compromise on this. Additionally, whether your preference is live chat, phone or email, BlueHost customer support is available 24/7. If you are a DIY (do it yourself) type of person, BlueHost also has a plethora of user support options at your disposal such as a knowledgebase, a getting started section, video tutorials and a lively user forum. And of course, you can always connect with BlueHost via every major social media channel – Facebook, Twitter, Google+, LinkedIn, YouTube, Pinterest and even Instagram. We made note of our preference of the vDeck control panel over the Cpanel in our iPage review, even though both are great choices. We are fairly certain the BlueHost engineers would agree with us overall, however BlueHost wanted to stay unique. They took the cPanel control panel and customized it to offer more functions while keeping it a plain and simple layout. The result was an unrivaled user experience, specifically for intermediate to expert users. While the design and dashboard is very easy to navigate for beginners, it also offers advanced functions such as domain management, 404 settings and SSL certificate management. BlueHost also integrated the Mojo Marketplace into the cPanel which simplifies website improvement, and shopping cart and blog setup. Perhaps the only reason why we still prefer the vDeck over BlueHost’s customized cPanel is because we are already familiar with vDeck. However, their customized cPanel is just as easy to use and user friendly. 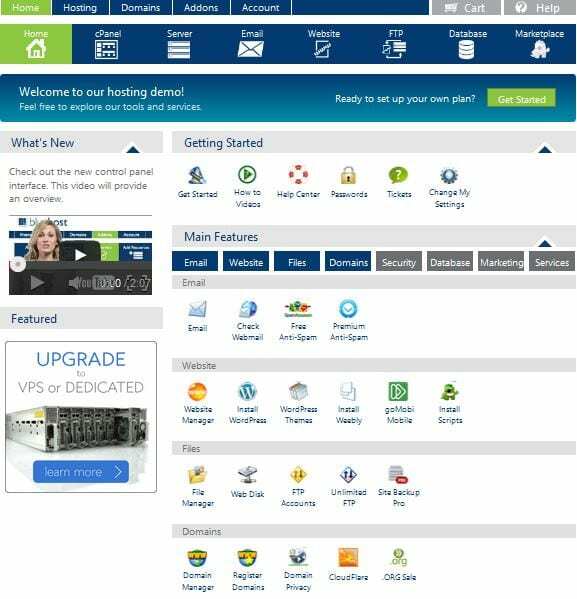 We highly recommend you play around with it; BlueHost offers a free demo of their cPanel. BlueHost’s website building is one area in which you can clearly tell has been tweaked so even a novice webmaster can use it. You can build a completely operational website and have it up and running within ten minutes. For example, BlueHost offers the Weebly website builder which uses the ‘drag & drop’ tool. You literally drag what you want and drop it into the place you want it to go on your website. For more professional customers, BlueHost allows you to use any site builder that is compatible with Apache servers. BlueHost also uses the Fantastico library for CMS installations like WordPress, which offers over 60 scripts that are 1 click installation processes. Furthermore, BlueHost offers dozens of themes to choose from. We have said it before and we will say it again. There is no such thing as 100% uptime. Nevertheless, BlueHost strives for 99.99% uptime and does not disappoint. We tested them on several occasions and we did not experience any downtime what-so-ever. They employ a nice sized team that is dedicated to maintaining the almost constant uptime. Also, as part of BlueHost’s drive for supreme reliability, they have a separate page on their website where you can test your server status. Simply enter your cPanel’s username and have the results within a matter of seconds. Additionally, because they use dual quad processor performance servers, you can expect your website to load at blazing fast speeds. BlueHost has really grown into a web hosting leader, specifically by offering high quality reliability and customer support. While their advanced (and standard) features are great and their customized control panel is cleverly designed, BlueHost really stands out by enabling websites to achieve tremendous speeds. And though many potential webmasters may believe BlueHost is only for intermediate to expert level users, BlueHost does in fact fully support even the most amateur of webmasters. Overall, it does not matter what type of website you have in mind. BlueHost is a solid choice for anyone to host or build a site.